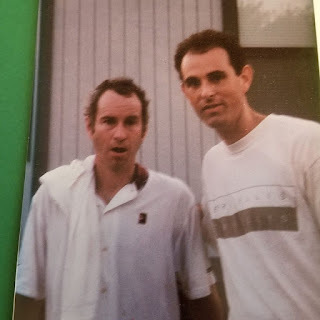 Circa year 2000, I met a childhood hero of mine, John McEnroe. He really is the reason I picked up a tennis racket. During the summer of 1980, the summer after I was cut from the 7th grade basketball tryouts, John played Bjorn Borg in the finals of Wimbledon in an epic battle that is considered one of the best matches in tennis history. I was sick with mono that summer - terribly ill. It was 1980, and I was 12. I hadn't had my first kiss yet, but somehow I ended up with mono, and I was bedridden for several weeks. I remember it vividly. My grandparents had not yet moved down to Florida where we lived. They were still in Chicago. That was Smoky Joe (Papa Morry) himself and my late Gramma Shirley. Papa loved golf, more than anything except his wife, kids and grandkids, and this summer in 1980, after learning I was bedridden with mono, he took to writing me long letters on the ins and outs of all the different golf shots. His mantra was always, "You must hit down on the ball in order for it to fly up." I can't tell you how many times he would repeat this in his golf love letters to me that summer, and even after he and Gramma moved from the windy city to Orlando, my home town. He must have written at least 20 of letters to me on how to putt, short game, getting out of the rough, driving the ball, all of it - all the while urging me to get better soon. I never did fulfill his desire for me to become a true lover of golf. Despite how I tried to pick up the game, I never really developed that passion for the game. Perhaps it was because of the ADHD in me that never allowed me the patience to truly enjoy it the way he did as well as many of my friends. Tennis, however, was about to bite me hard. Well, I digress, before even getting to the point of Johnny Mac. That summer, I was plunked down sick on the couch in our living room in Winter Park, FL (that's near Orlando) where I was born and raised - watching a small tv my mom set up for me. I turned the channel one day and saw a confident, wild, brash, curly haired kid of 20 having advanced to the finals against Borg that year in this now well-known epic match. I remember it clearly with NBC playing music in the background of "The Boy from NY City" . So the network carrying Wimbledon (I think NBC) played this song displaying Mac on the court, yelling, swinging his racket and ranting and raving. Yes, I was 12 at the time, in 7th grade, and as I mentioned had recently been cut from my junior high school basketball tryouts. This was a big surprise to me and a lesson of the importance of preparation, or lack of preparation rather and its ill-effects on life. This had been the most traumatizing event of my life of my 12 years, and proved to traumatize me for many years afterward, affecting my confidence. I became mesmerized by Mac during this Wimbledon tournament. I promised myself that once I recovered from mono, I would pick up the sport and it has in fact become my favorite sport of my life. Hey, come to think of it, maybe the trauma of getting cut from the basketball tryouts was actually what caused me to get sick. Just thought of that now. I truly enjoyed watching him play tennis as well as his antics on the court. He was entertaining in a way I had not seen in any sport before that. I was very fortunate to meet him twenty years later just after he started the senior tour in Chicago. I was 32 at the time. I would meet him a second time along with Martina Hingis years later at a Chase MVP event. Anyway, during this first meeting, I had a very nice chat with him and very memorable moment, and I will explain it here. I was with my friend Tanya at the time who had accompanied me to the tournament. After the match, John was walking alongside a reporter and there was a crowd of obnoxious people yelling at him trying to get his attention, "Hey Mac, let's see that temper!" and all kinds of things like that. I moved my way through the crowd and started walking alongside him and said very quietly since I was a bit nervous, "Hey John, I just want to pay you a compliment." His reply, "Oh yeah? What's that buddy?" He must have thought I was going to say some sarcastic comment to him. "Well, when I was a kid, I was sick with mono the year you played Borg, and you are what got me interested in tennis. Well, you are an amazing commentator now and you've been so great for tennis, so I want to tell you Thank You." He looked over at me and said, "You know what, pal, that means a lot to me. I really appreciate it." And I said, "sure thing." So, he kept walking and stopped to do an interview from behind a roped off barricade, and the crowd of people were still yelling at him and asking for a signature or a photo. "Come on, Mac, sign my kids tennis ball!" one guy yelled. I was just standing there next to Tanya, and as he was doing the interview, he kept glancing over in my direction while he was talking to the interviewer. I have to tell you, I still get chills and teary-eyed remembering this for some reason. So, he didn't give any autographs or pictures to anyone, and then, without warning, he yells out and points in my direction, "You! Come over here!" I couldn't believe it! So, I stepped over the rope and stood next to him in the picture you see below. Tanya couldn't figure out the camera and was taking a little long to snap the photo, and John says, "So, are you gonna take the damn picture already, or what?!" And then she snapped the photo that you see below. We shook hands and I thanked him. One of the best memories and moments of my life. I'm still not sure why this man climbed into my heart and still remains there. Maybe it was my hurt from being cut from the basketball team after that sport was such an identity crisis for me - it really did crush me. Perhaps, he saved me, in a way - and with his soft, creative and artistic way on the court, I was truly mesmerized. John, you're a legend, and I'll always be grateful to you. The photo kind of looks like we had played together which I sometimes joke around about with my friends, and one friend even commented that we had the same hairdo! But truth be told, we have never been on the same court, but maybe that will be for another time. John, if you're reading this, or if someone who knows John personally is reading this, I would be indebted for a short court-time with you one day. John McEnroe and Joe Omansky, game, set and match. A Shout Out Happy Birthday for my yeledim hijos.